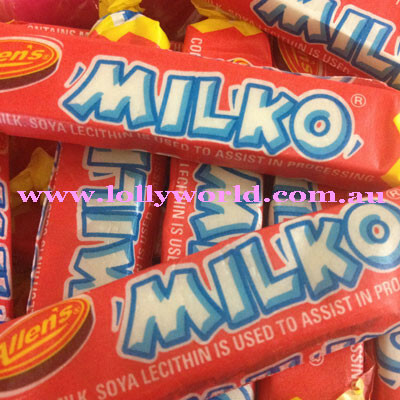 Allens Milko Sticks are a classic Australian Lolly. A sweet vanilla flavour chewy stick with individually wrapping. There are 10 Milko Sticks in a 100g bag and 64 in a 800g. Another great childhood favourite standing the test of time. I find kids today still love them. They are also on the Nestle gluten free list. Allens Milko Sticks are a classic Australian Lolly. A sweet vanilla flavour chewy stick with individually wrapping. There are 10 Milko Sticks in a 100g bag and 64 in a 800g. Another great childhood favourite standing the test of time. I find kids today still love them.